I don’t know if there’s any hunger quite as ravenous as that of a pre-teen coming home from school. Apparently, navigating the rocky social landscape of a middle school for seven straight hours stirs up quite an appetite. I remember many afternoons busting through the door, throwing my backpack down, and heading straight for the pantry to find something to munch. Back in my middle school days, my go-to snack was RITZ Crackers topped with sliced cheese, peanut butter, or my personal favorite, a smear of cream cheese. I’m sure if chocolate hazelnut spread had been a thing when I was a kid, that would’ve made the list too. My mom would usually join me at the kitchen table, helping assemble cracker sandwiches while asking about my day. I’m sure there were days I didn’t say much, maybe only managing a few cracker-crumb laced mumbles, but I know that time was important. It was a moment to catch my breath, detox from the day, and rest in the knowledge I was loved, cared for, and safe. I still use RITZ Crackers all the time in my kitchen (see this Hot Crab Dip and these fabulous Chocolate Dipped Fluffernutter RITZ cookies), but it had been years since I tried my favorite childhood snack. Unsurprisingly, the combo stands the test of time. 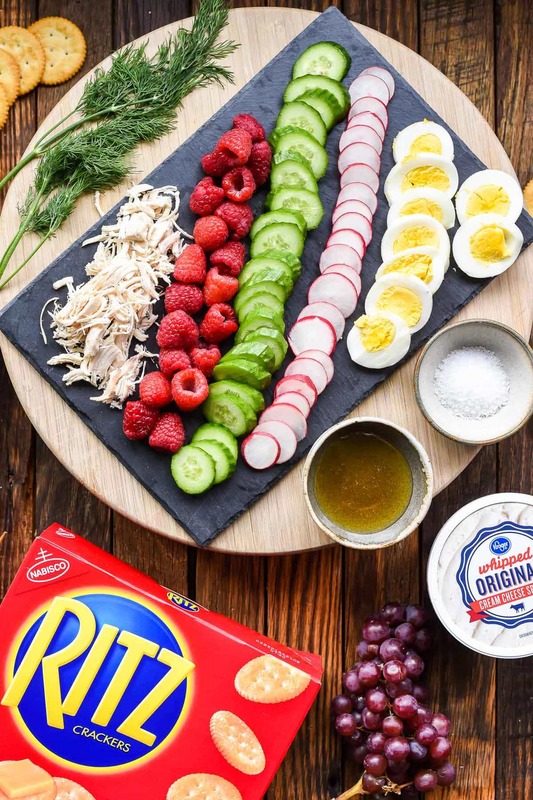 Pairing RITZ Crackers and cream cheese is still fabulous and made even better with some quick toppings to dress it up and make this an appetizer worthy of an after school chat session or a grown-up dinner party. 1) Cream Cheese + Cucumber + Dill. This is a re-creation of my favorite spring sandwich, Cream Cheese Cucumber Sandwiches, in cracker form. These are so refreshing and perfect for spring! 2) Cream Cheese + Radish- Very similar to the above, but with a nice kick from the radishes. 3) Cream Cheese + Raspberries + Honey- For a sweet option, I love combining lemony cream cheese with fresh berries and a drizzle of honey. Not surprisingly, these were my son’s favorite. 4) Cream Cheese + Hard Boiled Egg Slices + Capers + Dill- Oh my. 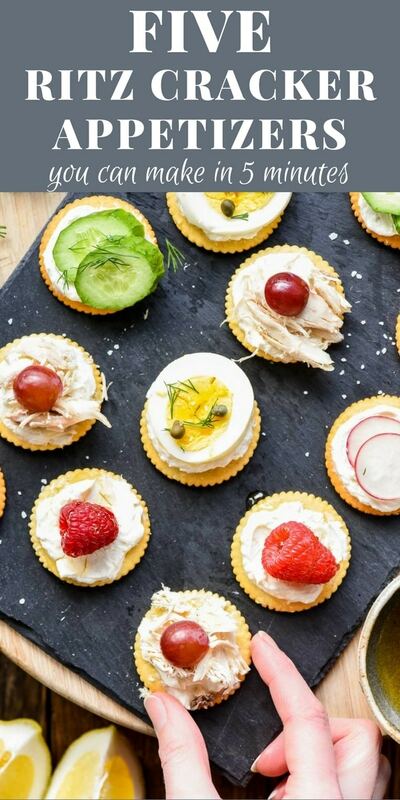 Just like a deconstructed egg salad, these little bites really hit the spot, and they’re perfect for using up leftover hard boiled eggs from your Easter celebrations. 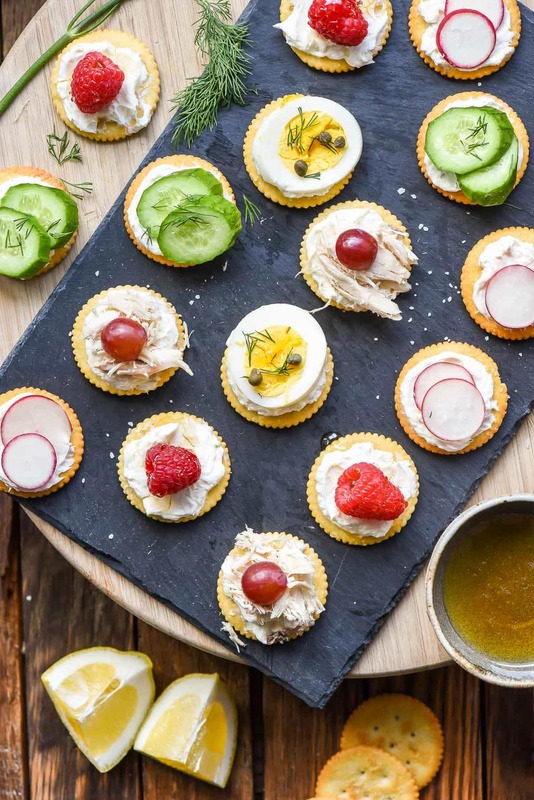 5) Cream Cheese + Shredded Chicken + Grapes- This is an appetizer take on my favorite chicken salad, which always includes grapes. Of course, these could also be topped with dried cranberries, pecans, or pistachios. This is definitely one you should craft to your own tastes! I made this platter on a Tuesday afternoon, and then set it up on the counter to meet my hungry post-work, post-nap crowd. It wasn’t long before all of us were gathered around munching, mixing and matching toppings, and talking about our days. 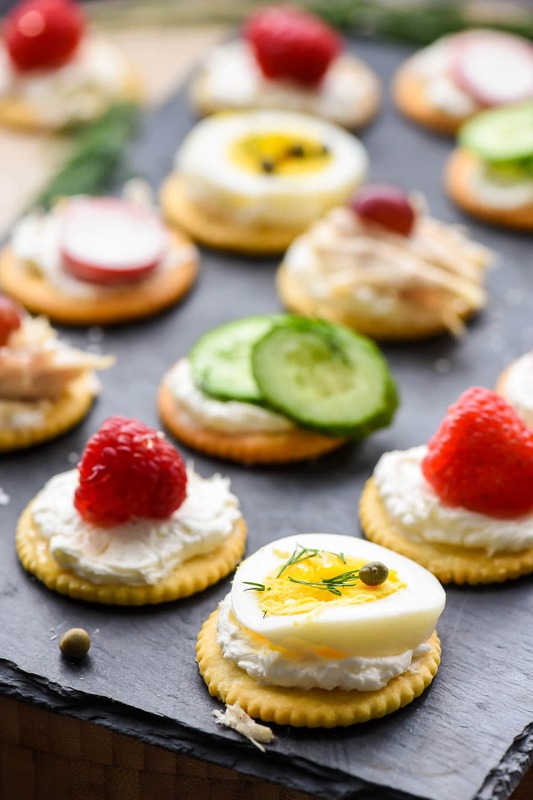 My hubby created one epic appetizer with the cream cheese, eggs, cucumber, radishes, dill, AND capers, and my son licked the honey off the raspberries and then ate the crackers and cream cheese (#kidsareweird). 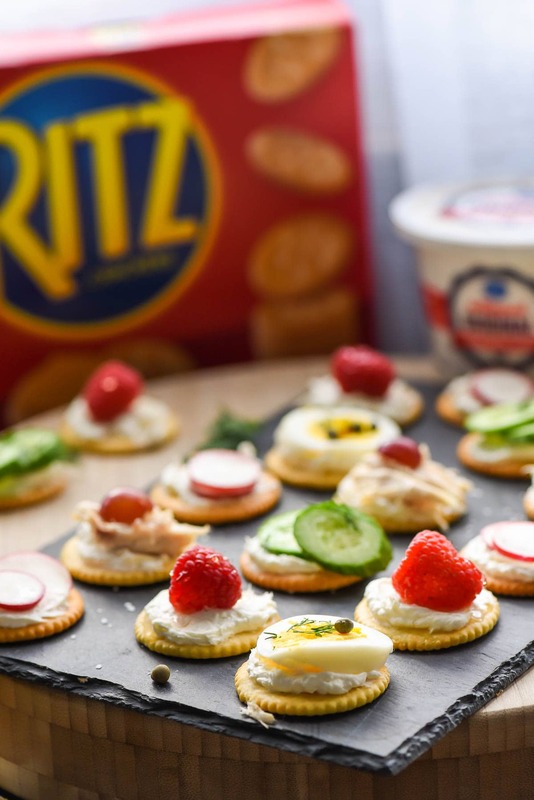 After witnessing the power of the cracker appetizer for myself, I think I’ll be following in my mom’s footsteps and keeping RITZ Crackers stocked in the pantry for last minute gatherings or a spontaneous party with my two best guys. 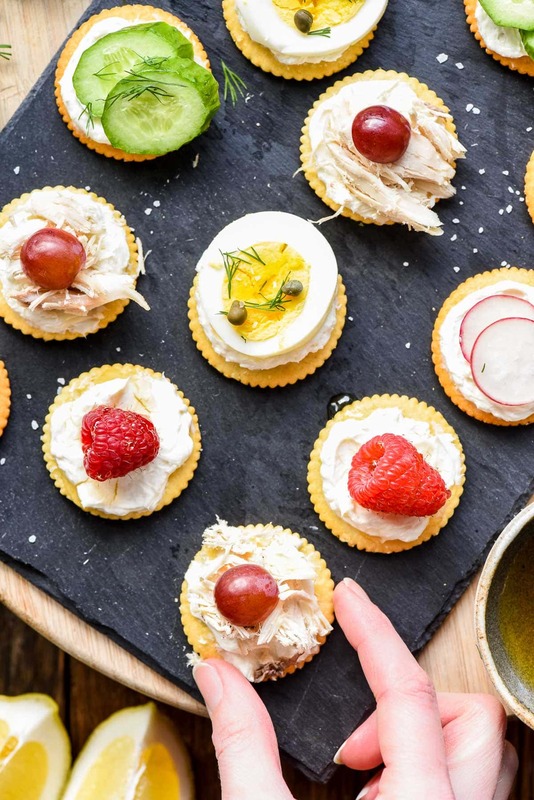 Try putting out your own cracker platter, and don’t be surprised if everyone suddenly wants to join you in the kitchen. You can purchase all you need for these easy appetizers at your local Kroger. You can also find all the fresh fruits, veggies, and herbs you need at Kroger, and even pick up a rotisserie chicken for dinner. 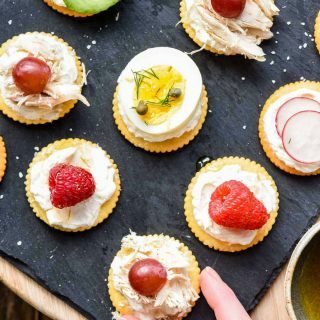 The leftovers would be perfect for these chicken salad bites! Happy shopping and happy cracker crafting, friends! 5) raspberries and a drizzle of honey. Finish any savory appetizers with a sprinkle of Kosher salt. Best served immediately. Great savory snack ideas for entertaining and casual eating. Saving this to Pinterest for those occasions. I’ll use rice crackers for those gluten-free options as well.